Chevron. Herringbone. Zig Zag. Call it what you may, but this pattern was trending in big ways in 2011. And we think it may stay a while for 2012! This is a distinctive, bold graphic, a trend with endless possibilities. In fashion, chevron can be dressed up with florals, or complement solid colours. We love that it is so striking and versatile! 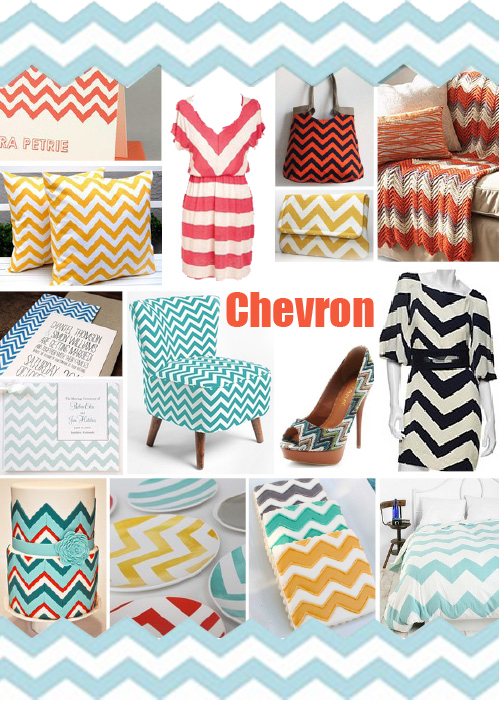 No matter how it is used in the home, chevron will be a way to make a strong, bold statement. Paint the pattern onto an accent wall to spruce up areas of your home, or place chevron pillows on solid colour linen. However you use it, there is no denying its pizzazz. And if you aren’t ready to make too much of a statement, simply add a chevron clutch or heels to your outfit – chevron is striking no matter how it is used!